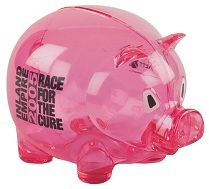 Our Custom Piggy Banks with Logo don't fly, but they surely gain some fantastic advertising for your business. Hand out a batch of these and you can't fail! Great when sat on the customer's desk, they'll act like your own little silent salesman, gaining valuable exposure and increasing your profit margin along the way. Save pennies and choose the right business gift for the right occasion. Transparent, and available in red, green or blue , your printed artwork can be personalised and printed in a five colour spot printing, which includes your artwork, logo, branding and even the possibility of your contact details on both sides of the Custom Piggy Banks with Logo . Hand out some Custom Piggy Banks with Logo at trade shows and exhibitions and you'll be surprised on the increase of customers! For a FREE QUOTE, please fill in the form regarding our Custom Piggy Banks with Logo and we'll be able to help you. Why not check out some of our other promotional gifts?